Amy Goodman of Democracy Now was arrested in Minneapolis today. According to the description of the video, she and two others are charged with conspiracy to riot. According to Coldsnaplegal, she was pepper-sprayed while handcuffed. The protests in Denver began today. There was some attempt by protesters to block streets. It was peaceful with little resemblance to protests of conventions past. What happened instead was a street-fair display of disparate causes, from anti-war fervor to climate control, immigrant rights and the legalization of marijuana. Participants paraded through the streets of downtown Denver peacefully as police — aided by the Secret Service, FBI and National Guard — kept watch from bikes, rooftops and helicopters. Cindy Sheehan and Recreate '68 began the morning with a protest event on the steps of the state capitol in Denver. Later, there was a march from Civic Center Park to the Pepsi Center. Who knew what they were thinking when they built the makeshift warehouse jail cells for those arrested during the Democratic National Convention, but at least they've scrapped one bad idea. Sixty people an hour can be processed at the building, where cameras are set up to take mug shots alongside computerized fingerprinting stations. A table holds six telephones, and two portable air-conditioning units each the size of a small truck pump cool air into the building. Each cell will contain 20 chairs. A sign posted on a steel column warns: "Electric stun devices used in this facility." 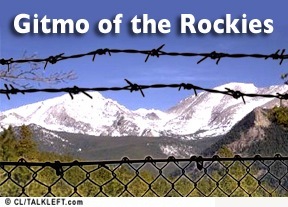 Anyone arrested in East Denver, not just protesters, will be transported to "Gitmo on the Platte." Denver's CBS4 News reporter Rick Salinger scores an exclusive on Denver's plans for arrested protesters in the event of mass arrests -- as proof, he and his camera people got inside and shot this video before being asked to leave. The facility is a city owned warehouse. "This is a secured environment," Capt. Frank Gale of the Denver Sheriff's Department told CBS4. "We're concerned about how that's going to be utilized by people who will be potentially disruptive." Denver officials announced today that the protest zone for Invesco Field where Sen. Barack Obama will deliver his nomination acceptance speech will be in the parking lot. The lot will be fenced. The fenced-in area will be about 53,000 square feet in Lot J. Delegates entering the convention will pass by the area from between 200 and 400 feet away after they are dropped off for the night's speech by Sen. Barack Obama. Protesters will be allowed to use bullhorns, and the city will provide a stage, amplification equipment, and at least two speakers that will be located outside the zone and pointing toward Invesco Field at Mile High. Here's the map (pdf) showing Lot J. In related news, the protesters are offering Denver a "doo doo accord" (pdf copy here) and yes, it's just what it sound like -- it's in reponse to the City Council's upcoming final consideration of a law banning protesters from carrying buckets of the human stuff. The city also announced today that none of the equipment purchases include nonlethal weapons that discharge "slime" or "goo" to immobilize persons or vehicles or that use microwaves or sonic waves to induce pain or discomfort in targets. The ACLU was relieved -- so much so that it agreed to wait until the convention is over to decide whether to return to court and seek more information. Security With Advanced Technology, Inc. (NasdaqCM:SWAT - News) reported that its Veritas Tactical business segment has received a purchase order from the City and County of Denver, for the Company's recently introduced rifle launcher and pistol launcher as well as projectiles and associated accessories.